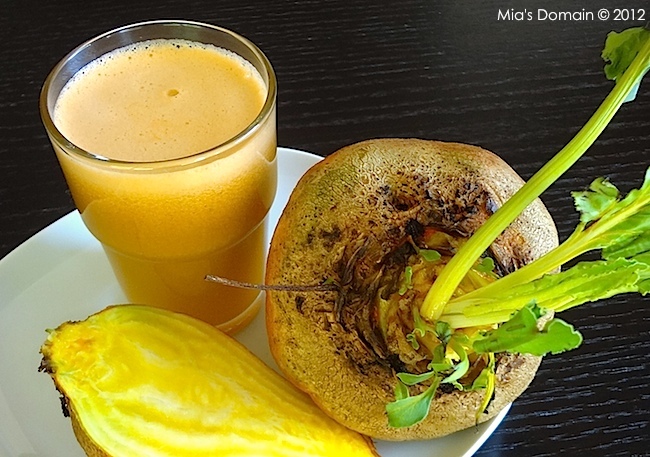 You will need a juicer for this recipe. Insert all the ingredients into the juicer. Best served fresh. Beets are highly nutritious and “cardiovascular health” friendly root vegetables: protection against coronary artery disease and stroke; lower cholesterol levels within the body, anti-aging effects. Pineapple fruit contains a proteolytic enzyme bromelain that digests food by breaking down protein: excellent source of antioxidants, vitamin C; protect from scurvy, helps develop resistance against infectious agents (boosts immunity). Also rich in B-complex vitamins like folates, thiamin, pyridoxine, riboflavin and minerals like copper, manganese and potassium. Potassium is an important component of cell and body fluids, helps controlling heart rate and blood pressure. Copper is helpful cofactor for red blood cell synthesis. Manganese is a co-factor for the enzyme superoxide dismutase, which is a very powerful free radical scavenger. Fast Food as Addictive as Heroin?